Following on from our Interview with Jacinda and Grant outlining their 100 days achievements, our next Ngā Kōrero event is locked and loading! 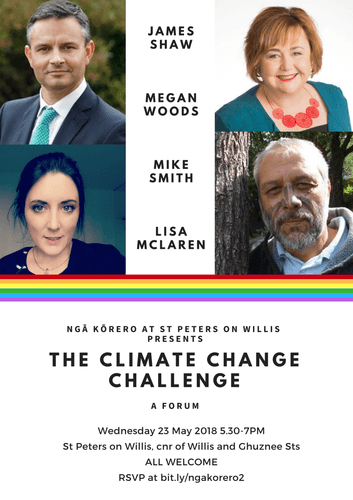 We will welcome Climate Change Minister the Hon James Shaw, Minister for Energy and Resources Hon Megan Woods, Senior climate campaigner Greenpeace Aotearoa and Climate Advisor to the Iwi Chairs Forum Mike Smith, and National Convenor Generation Zero Lisa McLaren who will discuss how New Zealand is going to answer the Climate Change Challenge! Send your burning questions to ngakorero@stpetersonwillis.org.nz and we might even ask them on the night!